Fascist politics are running rampant in America today and spreading around the world. 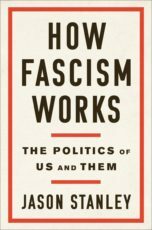 Yale professor Jason Stanley talks about the ten pillars of fascist politics, and the history of how it rises. Guest: Jason Stanley is the Jacob Urowsky Professor of Philosophy at Yale University. He is the author of several books including his latest How Fascism Works: The Politics of Us and Them. Please donate to KPFA Today!! !